With Sony’s and Microsoft’s excellent conferences having already worked E3 attendees into a frenzy, Nintendo took to the virtual stage Tuesday to deliver their annual E3 non-conference. As is becoming tradition, Nintendo opted out of the standard live press conference and instead offered a canned video presentation, essentially an hour-long Nintendo Direct. Did Nintendo keep the hype train rolling, adding to the momentum created by Bethesda, Microsoft, Sony, and other E3 presenters? Did they deliver an impressive, jaw-dropping presentation that would earn them a stream of coveted “Nintendo Wins E3” tweets and headlines? 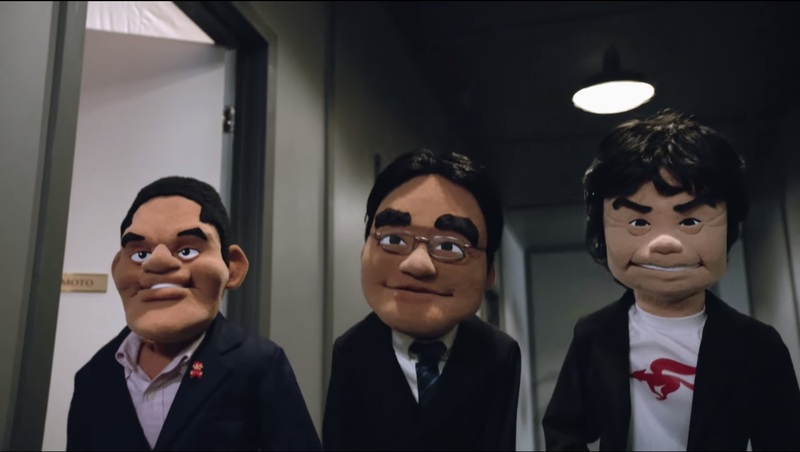 Nintendo’s presentation this year was, in a word, underwhelming. Even disappointing, at least for Wii U owners. Big 3DS fans, and especially fans of Japanese games, might have found more to like, but the presentation did not bode well for Nintendo’s home console. So before we get into the Wii U announcements and start dissecting Nintendo’s performance, let’s take a look at the 3DS games Nintendo unveiled. Games. Games games games games games. Lots of games. All of the games. That was the message of Microsoft’s press conference yesterday. Microsoft has been calling this the best games lineup in Xbox history, and while I haven’t gone through year-by-year and compared them, yesterday’s conference certainly made a strong argument. The show of course featured all of Microsoft’s heavy hitters: Halo, Tomb Raider, Gears of War, Fable, and Forza. The show opened with a montage of characters (and cars) from these franchises, and each franchise popped up at some point during the conference. But in addition to these big, predictable titles, Microsoft dropped a number of surprises. Let’s take a look at the blow-by-blow. The show kicked off with a trailer for Halo 5: Guardians. I’ve never been much of a Halo fan – I’ve only played Halo 3 – but the game looks impressive. With a couple of people onstage holding controllers, we were treated to a (presumably) live demo – the first of many throughout the night – of co-op Halo 5 gameplay, which we’re told is “seamless drop-ion, drop-out co-op.” Microsoft also showed off the multiplayer, announcing a new Warzone mode with huge arenas and 24-player battles. Without really knowing what I’m talking about, I would say that Halo 5 looks like a pretty good bit of fan service. We’ve had some little news drops over the last week or so, like the Fallout 4 trailer and the Smash Bros. Nintendo Direct, but with Bethesda’s press conference last night, E3 2015 has finally started. And what a start! Bethesda threw a lot of footage at us, a lot of which looked pretty great, and a few little surprises, too. So let’s take a quick look at what we saw. 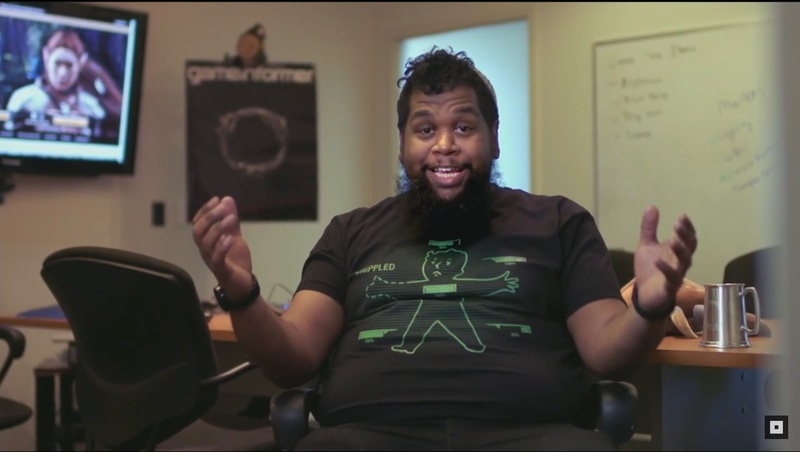 First of all, Bethesda employees get a lot of cool t-shirts. I want all of them. But anyway, the games. The show kicked off with a pretty in-depth look at Doom, and it looks like a lot of fun. Doom is not looking to reinvent the wheel; this game is aimed straight at people who loved the original Doom and Doom II in the early 90s. Doom is a game about flying chunks of flesh, geysers of blood, double-barreled shotguns that reload in a fraction of a second, slicing through demons with a chainsaw, and exploding barrels. The trailers Bethesda showed us – there were four of them – had buckets and buckets of that goodness. 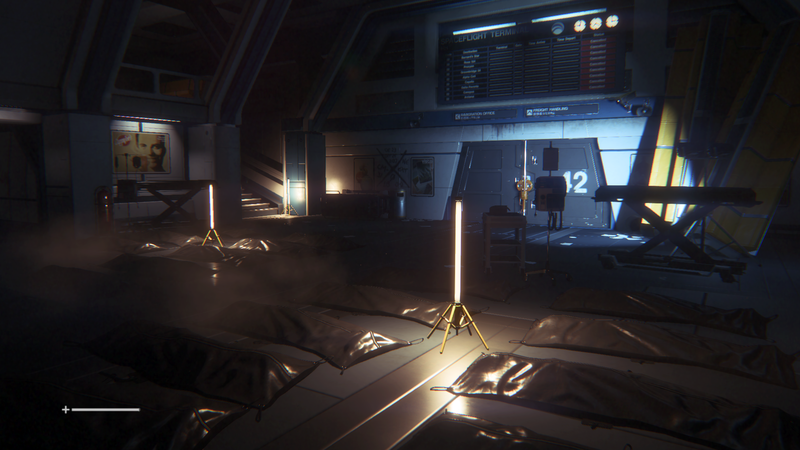 Alien: Isolation is one of those games that gets me really excited until days before its release, when reviews begin to pop up and it starts to look like much of the game’s potential was left unrealized. In days gone by, I would go to the local Blockbuster and rent a game like this; depending on how much I liked it, I would either buy it, keep renting it until I beat it, or return it after a few days. But with game rental largely a thing of the past, games like Alien: Isolation get relegated to the ever-growing backlog, waiting until I can grab a used copy for a price that matches my expectations. 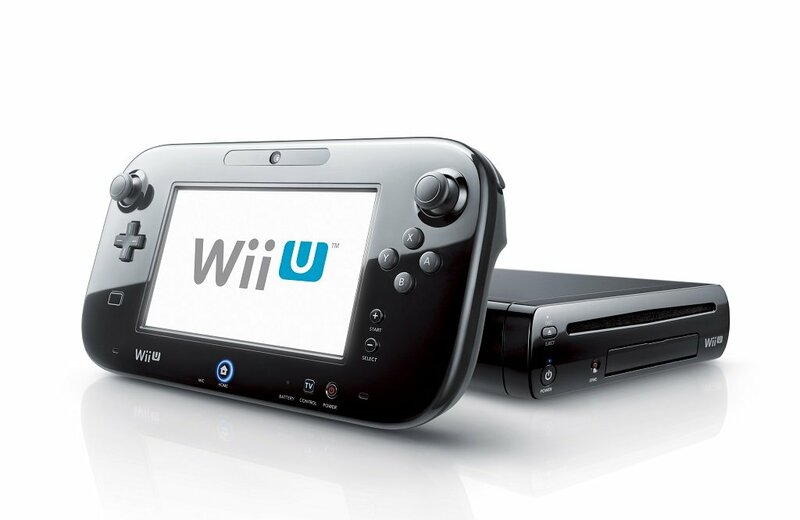 With the hundred-million-selling Wii having largely faded from public consciousness, Nintendo in 2012 decided to release the Wii U. Two-and-a-half years later, the system is struggling to reach the ten million sales mark. Third parties have largely abandoned the console, and Nintendo doesn’t seem to have many bullets left in the clip, having already released entries in most of its major franchises. It’s unlikely that anything is going to turn this ship around; no matter how good Splatoon is, it’s not going to send another ten or twenty or thirty million people out to buy a Wii U. No, when all is said and done, the Wii U is going to go down as a failure. But why did it fail? The Wii U has been a failure for a lot of reasons, some of them inevitable. As we’ve seen, Nintendo gave up on trying to woo core gamers to instead pursue casual gamers, and by 2012, those gamers had moved on to smartphones and tablets. Because of Nintendo’s inability to convert Wii owners into reliable customers, any attempt to leverage the Wii’s success to sell a new console was probably bound to fail. Really, the Wii U falls perfectly in line with what’s been happening to Nintendo for basically ever. 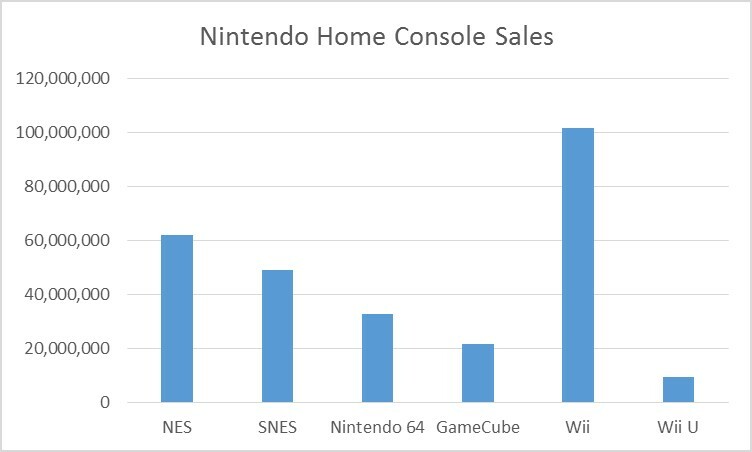 Nintendo’s sales have been in steady decline for decades, the Wii notwithstanding. Every Nintendo console, except the Wii, has been the worst-selling Nintendo console to date. A single hit isn’t going to change that if it doesn’t address the core problems behind this decline. In the first part of this post, I examined how Nintendo, with the Wii, traded core gamers for casual gamers, a strategy that worked in the short term but cost Nintendo in the long term. When smartphones and tablets emerged as a major gaming platform, especially for casual games, they left Nintendo with no market for their new hardware. They sold over 100 million Wiis, but are struggling to sell one tenth as many Wii Us. There’s obviously nothing Nintendo could have done to forestall the rise of the mobile games market. But this doesn’t mean that the evaporation of Nintendo’s audience was a foregone conclusion. After a surprise countdown showed up on Bethesda’s website yesterday and sent the Internet into a tizzy of Fallout 4 anticipation, the game’s official trailer dropped this morning. It hits all the familiar notes, has a next-gen level of polish (kind of), and shows off a post-apocalyptic Boston. There are a lot of fun little nuggets buried in this trailer, and now that I’ve had almost two hours to pore over it, here are my first impressions. Between the lackluster sales, the dearth of third-party support, the recent announcement of the Nintendo NX, and the indefinite delay of the latest Legend of Zelda game, it would seem the writing’s on the wall for the Wii U. Though Nintendo insists that the NX won’t be a simple replacement for the Wii U (or 3DS), it’s hard to imagine a scenario where the release of the NX – whatever it is – ends up boosting Wii U sales. After two and a half years and about 9.5 million units sold, we can confidently declare that the Wii U has been a commercial failure. Take a good look. It won’t be here forever. Nintendo needs the NX to be successful. The company remains committed to dedicated gaming devices, but another system that sells as poorly as the Wii U did will force them to reconsider that position. So what should they do with the NX? How can they avoid a repeat of the situation they’re in with the Wii U? To understand that, we need to take a look at everything that went wrong with the Wii U. And to understand that, we first need to hop into our DeLorean and look at the ways the Wii failed, and the ways Nintendo failed the Wii, because, in a lot of ways, the Wii is what put Nintendo in this mess.